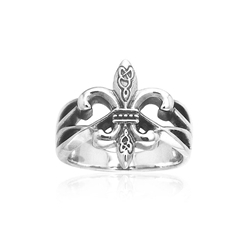 Crafted in sterling silver; this ring features the fleur de lis, delicately accented with knotwork. Recognized as the symbol of the French monarchy, the fleur de lis is a stylized lily. Please note: This item is not available for rush delivery, please allow 2-3 weeks for delivery.